You see, we have been to numerous fishing seminars and lectures over the last few years. One seminar we took was on Blue-fin Tuna. The class was informative and scary at the same time. When you have a tuna on the line, you could literally work for hours and then lose it. Many things can go wrong. The lecturer told us you need to have a minimum of four crew members on board to properly land a tuna – one to navigate the boat, one to gaff the fish, one to handle the leader, and of course, the angler to bring the fish in. He told us many stories of anglers putting up the fight of their lives and having the line snap or the hook pull. These fish are so powerful, that they dive under the boat which causes a lot of lines to rub and snap off. The devastation in these angler’s eyes and the experience that would haunt them for years to come was a direct result of the rule of tuna fishing, “anything can go wrong”. After we took the class, we bought the basic equipment. The stand-up gear, 2 rods, 2 reels and the safety harness for the rod and the angler. We had not fished for tuna all year and every-time I would walk into my husband’s office, I would see the rods leaning against the wall challenging me. Well today was the day I would accept that challenge. 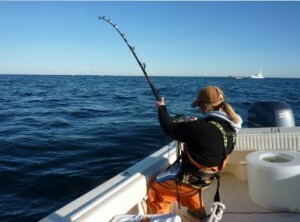 For our wedding anniversary, I told my husband I wanted to go out and fish for Tuna. We packed up the gear & cooler and headed out to catch some live bait. We wanted to enter the arena of tuna fishing with minimal expectations and setup. No kites, no out-riggers and no spreader-bars. We were going to fish what we knew and felt comfortable with…live pogies. After we caught our bait, we headed towards the tuna-grounds. As we approached, I could see hundreds of boats off in the distance. I began to get nervous and excited. We looked around and saw some bird activity. We had found our spot. We dropped the anchor and got our rods placed in the new swivel holders. We baited the lines and sent the pogies out. As I was getting out some snacks to munch on and setting the radio station, we both heard the reel begin to screech. We both looked at each other and started running towards the rod. But the sound stopped. My husband reeled in the line. The pogy was gone. He baited the hook again and sent the pogy out. We chatted a bit about what we thought happened, but were very excited to have an empty hook. This meant there was life down there. What kind, we had no idea. As I proceeded to get my snack out again, we heard another noise. Only this time, it was a louder and faster screeching noise. FISH ON! I screamed like I was a kid on Christmas morn. “Fish on..Fish on..Fish on!” I ran to the rod, pushing my husband out of the way and buckled myself in, for what would be the ride of my life. I set the drag to fighting mode and began to crank on the “paint can” reel. The adrenaline kicked in and my heart was pumping so hard that I didn’t even know what was going on around me. All the boats were blurry. It truly was just me and the fish in this moment. I was fighting so hard, that every extra layer of clothing was getting ripped off. I was sweating and screaming. If the Coast Guard had been in the area, I am sure they would have picked up their binoculars to make sure no one was in danger. I lasted 30 minutes in the stand up gear but my back was killing me. I didn’t know it at the time, but the entire bucket harness was wrapped around my back. I wasn’t actually sitting in the harness. The entire time I fought this fish, I was thinking of Capt. Eric’s seminar. Don’t let the fish go under the boat. Don’t let the line snap. Be careful not to pull the hook. Was I doing it right? Was I ever going to land this fish? Would I get it all the way to the boat and lose it? The fear was starting to set in. My husband must have asked me a million times if I needed help. I do remember telling him if he touched the rod, I would kill him. It is kind of how I imagine labor to be. In the heat of the moment, you say things out of passion and don’t even realize what you are saying. So after 70 minutes, I saw the fish. It was finally here in front of me. The shimmer was so beautiful. The screaming started again. Get the fish. Don’t you dare lose this fish. My husband grabbed his harpoon and launched it like he was in a track and field event. He got the fish. WE GOT THE FISH!!!! I felt like I had just given birth. I was sweating profusely. I was panting and doing lamaze breathing. I was doubled over crying. I did it on my own. I had done what so many people don’t get the opportunity of doing and I did it on my own. We didn’t have 4 crew members. I didn’t have the harness on correctly. I hadn’t pulled the hook. We landed the fish. I cannot express on paper what that moment felt like. As I write this blog, I am smiling and reliving the entire day. To my husband – thank you for giving me the greatest possible gift on our anniversary. It will be a day I will never forget! I am 5’2 and weigh 98 lbs. 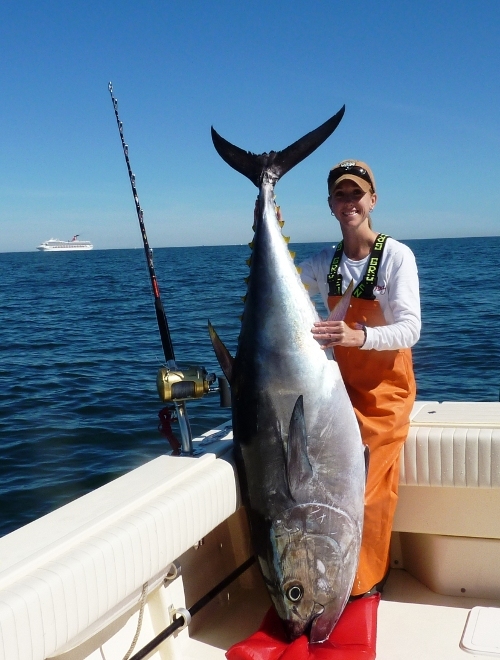 The tuna came in close to 200lbs and measured 67 inches. Truly the best gift yet. And that is why they call me an anomaly…and I have to agree.